This set of Foundry Quiz focuses on “Core and Shell Moulding”. 1. _____________ is well known as the expendable molding process. Explanation: Shell molding uses a resin which is covered in sand to form a mold. This mold casting involves the use of non-reusable or temporary sand depending upon the casting to be made. Hence, it is known as expendable mould. 2. The patterns can be __________ after the pattern is prepared from shell molding. Explanation: The pattern is placed in a mould in shell casting is a thin-walled shell which is created using a sand resin and applying it all over the pattern. This makes the pattern to be easily reusable for the next subsequent processes. 3. Shell molding has better dimensional accuracy than any other casting process. Explanation: Shell molding is conducted using an expendable mold. As it includes sand, plastic and investment moulds, the dimensional accuracy obtained from this sand casting. It is used for small to medium parts. 4. Which of the following is not used in the shell molding? Explanation: In a shell molding process, the pattern is incorporated with the gating system as it has to be coated with the required sand resin before the process begins. It does not require the gating system separately. 5. Which of the following cannot be made from the shell molding process? Explanation: The valves are prepared using a pressure die casting process or it is done by a green sand molding process. It does not require high work to be done on pattern making which is done in the shell molding process. Explanation: The lead time refers to the time between the loading and unloading of the component before and after finishing respectively. As the process is automated in the shell molding, the lead time required is short. Explanation: The shell mold casting process uses the thermosetting binder so that they can harden the thin shell of sand when they are baked. They prepare the sand with the properties required for the processes. 8. The typical parts like cylinder heads, gears and bushings are produced using the shell molding process. Explanation: The shell molding process is suitable for the castings which are low in weight. Usually, they weigh around 20 lbs. As these components are of low weight they are manufactured by the shell molding process. 9. ________________ facilitates the removal of the shell. Explanation: In the shell molding process, the pattern is coated with sand and typical binders and a shell are created over it. After the shell is done, a parting agent is coated over it to facilitate the easy removal of the shell. Silicone is a parting agent. 10. The thickness of the shell is dependent upon the strength required for the mold for the specific metal casting application. Explanation: The reaction of the thermosetting resin with hot metal pattern forms the thin shell on the surface of the pattern. The thickness of the mold can be controlled by the length of the time the sand mixture is in contact with the pattern. 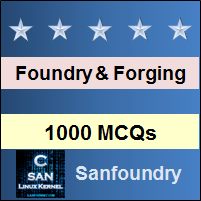 To practice all areas of Foundry for Quizzes, here is complete set of 1000+ Multiple Choice Questions and Answers.